Our head brewer Paul McNeil, and president Curtis Stillman, were sharing a pint one evening and in a fit of ambition decided that opening a brewery would be a masterful idea. This idea was then brought to Pam Spurrell, an avid beer drinker and brewery seeker, and the dream of Lost Towns Brewing was born! At Lost Towns Brewing we are farmer brewers! Curtis and his wife Halley own Still Life Farm in Hardwick, MA. The farm is the backbone of the brewery. We are passionate that you should taste the essence of Still Life Farm’s local produce in the beers we brew. Local farm ingredients incorporated into our beers include summer fruits like apricots and cherries, fall produce like apples and pumpkins, and aromatic fresh herbs like lemongrass and basil. 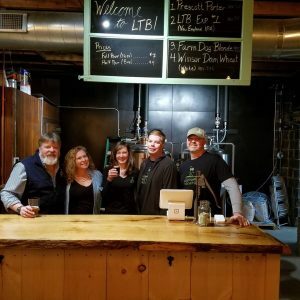 Lost Towns Brewing’s connection with the farm gives us the unique opportunity to try some “outside the box” beers with an emphasis on locally grown ingredients. We love beer! Our brewer Paul McNeil has been brewing amazing beer for the past 30 years. Paul specializes in easy drinking IPA’s and tasty wheat beers – often enhanced by farm fresh fruit – not to mention some seriously luscious porters and stouts that round out the Lost Towns Brewing beer line-up. Our name infers how much we love our community and our connection with the Quabbin Reservoir. We care deeply about the past, present, and future of our town of Hardwick and the surrounding Quabbin Valley area. Our hope for the brewery is to create a community space for those who love what we love, and we are committed to sourcing as many local ingredients as possible, while keeping it in within our local economy. Pam Spurrell, long-time locavore and craft beer advocate believes that the closer it is to home the better it tastes. Come visit us at Lost Towns Brewing! Keep it local, keep it fresh, and keep it flowing!